On this page I tell you how to get to Litchfield National Park, about the best time to visit, where you can camp, and what you can see and do there. From Darwin follow the Stuart Highway to Batchelor and turn right. From there it is not far to the main park entrance. This is the most popular access route because it is all bitumen. Follow the Stuart Highway for only 57 km. Turn right in Berry Springs (following the sign to the Territory Wildlife Park). From there it is another 58 km to the northernmost park entrance. This route includes 42 kilometres of unsealed road. That's not a problem during the dry season, but during and shortly after the wet season (Nov - April) access may be restricted or require four wheel drive. The Southern Access Track can be reached via the Daly River Road. The access track is four wheel drive only. It's a good route to take for people coming from the south, or continuing their journey from Darwin towards Katherine. This part of Litchfield National Park is obviously less crowded than the main sealed road. The downside is that the road is closed during the wet season. Once inside the park you will find that all the attractions are very close together, so you really can spend most of your day swimming or exploring rather than driving. Litchfield National Park can be visited all year round. The main road is all bitumen. But the four wheel drive tracks will usually be closed during the wet season (Nov - April), so some areas will be inaccessible (The Lost City, Tjaynera Falls, Surprise Creek Falls). But the main attractions, like Wangi and Florence Falls, can be visited all year. The wet season is actually a good time to see them. The falls will be thundering, not just dribbling, and there are fewer tourists around. 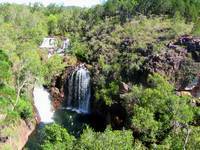 Litchfield National Park gets very busy during the peak of the dry season (June-August). My favourite time is the very beginning of the dry season, as soon as the roads open up again. There is still a lot of water around, lots of wildflowers are at their peak, but there aren't too many tourists. Entry into Litchfield National Park is free. The only accommodation available inside the park is camping. You can camp at Wangi Falls, Florence Falls and at the Buley Rockholes. Caravans are only allowed at Wangi Falls, but there are no powered sites. If you have a four wheel drive there's also Sandy Creek (Tjanyera) Falls, Surprise Creek Falls and the 4WD camping area downstream from Florence Falls. Or you go for a short walk to one of my favourite campsites along Walker Creek. A small fee is charged for most of the sites. If you need a powered site or want to avoid camping you can choose from several accommodation options just outside the park. Most people come here for a swim and a picnic, and to do some of the short walks. All the attractions are so close together that you can see quite a bit in one day.